Our dog is supposed to be dead. Picked up as a skin-and-bones stray, he was scheduled to be euthanized in a high-kill shelter a few days before a rescue transport van arrived. A shelter worker hid him, hoping the transporter had room for him in her van and her small rescue facility. As I understand it, our dog sniffed the transporter’s hand, looked at her and wagged his tail hard — which is why he is now lying here at my feet, wagging his tail for me. 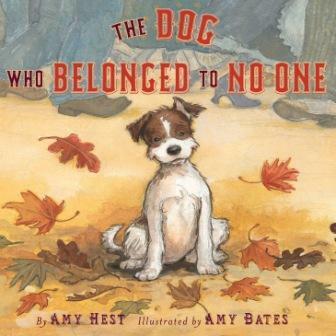 I am partial to rescued dogs and their rescuers, so I was drawn to The Dog Who Belonged To No One by Amy Hest, author of the Baby Duck books. We are not given any background on the nameless dog, but we know he is feeling very lonely. As he trots around town, he does kind things for others hoping they’ll befriend him. Meanwhile, Lia, the young daughter of two bakers, delivers their wares on her bike. She pedals around town on her delivery route while the other children play, making up stories to amuse herself. One day, both dog and girl are caught in a bad storm. The dog seeks refuge at the bakers’ home just as a soaked Lia is arriving, pedaling furiously. Inside the warm house, the mother dries the happy little beings off together in one cozy towel while the father looks on as he kneads bread. Lia and the dog remain together and are lonely no longer. Amy Bates’s illustrations are rich and lively. I especially enjoy the illustration of children playing together while little Lia looks at them longingly, about to ascend yet another hill on her outsized delivery bike (oh, the tugging of the heartstrings!). This story depicts a stray dog’s life while remaining true to the picture book audience. Neither my son nor I were uncomfortable with the description of the dog’s unfortunate situation. In our household, we love a happy ending and this story has it. May other animals be so lucky.